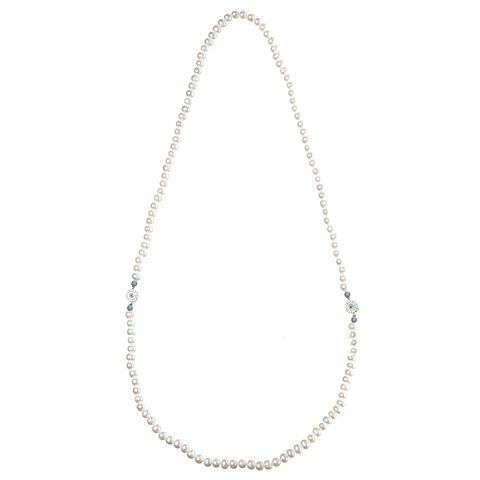 Subtle in its elegance, the Lucky Eye Silver Necklace is strung with freshwater pearls, fluted blue agate beads and shines with lustrous eighteen karat white gold-plated accents. Sparkling with a diamante lucky eye charm, this delicate necklace is the kind of jewellery piece that will warrant dozens of compliments from fashionable strangers and is the perfect gift for a lucky person in your life. Made with freshwater pearls and fluted blue agate beads. Eighteen karat white gold-plated accents. Fastens with a lobster closure.